Apr. 10, 2019: OSilas Gallery at Concordia College recently opened Bronxville Collects: Selections in Contemporary Art from the Local Collector. This exhibition features works by both established and emerging artists that are on loan from five Bronxville families. Collector preferences in art are very personal. A collector may be drawn to a particular work because of the time period during which it was created, its medium, its color palette, its subject matter, or myriad other reasons. 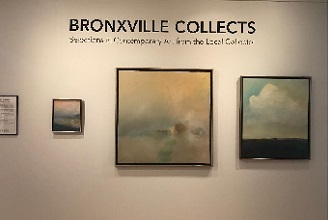 This contemporary art exhibition is meant to explore the reasons these collectors acquire art and their connection to the artwork featured in Bronxville Collects. While their motivations for collecting and their tastes in art may differ, the one thing that all the collectors whose works are featured in the exhibition share is a desire to have art be part of the fabric of their daily lives. Bronxville Collects will be on show through April 27 at OSilas Gallery in the Donald A. Krenz Academic Center on the second level of Scheele Memorial Library on the campus of Concordia College at 171 White Plains Road in Bronxville.